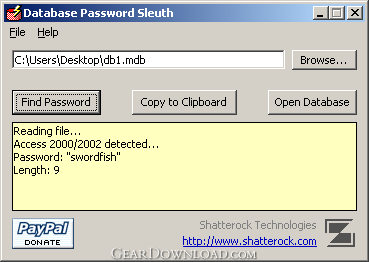 With Database Password Sleuth, you can instantly recover the opening password for Microsoft Access 95/97/2000/2002/2003 databases. Simple to use interface, instant recovery, and does not use brute force methods. Just browse your computer or network, select the Access ".mdb" database file and press the get password button. Unlike many other recovery services and programs, this one is completely free! This download (dbpwd.zip) was tested thoroughly and was found 100% clean. Click "Report Spyware" link on the top if you found this software contains any form of malware, including but not limited to: spyware, viruses, trojans and backdoors. HDD Regenerator 2011 - HDD Regenerator repairs bad sectors on hard drive surface. RecoverPlus Photo Recovery 2.7.82 - Digital Photo Recovery of all lost, deleted and formatted photo's on all media. FILERECOVERY 2016 Standard PC 5.5.8.4 - FILERECOVERY 2016 is for recovering lost and deleted files. PHOTORECOVERY 2014 for Mac 5.1.0.2 - PHOTORECOVERY 2014 recovers images, movies and sound files.